IT is the accepted belief that it is in the literature of the brahmins that we find the evidence as to the religious beliefs of the peoples of India in the sixth and seventh centuries B.C. This seems to me more than doubtful. The priests have preserved for us, not so much the opinions the people actually held, as the opinions the priests wished them to hold. When we consider the enormous labour of keeping up and handing down the priestly books  and this had to be done, as we have seen, entirely through learning the books by heart  we are filled with admiration for the zealous and devoted students who have thus preserved for us a literature so valuable for the history of human thought. The learned brahmin, and not only in this respect, is a figure of whom India is justly proud. And when we consider how vague and inaccurate are the accounts preserved in the writings of the Christian fathers of any views except those they themselves considered to be orthodox, we see how unreasonable  it would be to expect that the brahmins, whose difficulties were so much greater, should have been able to do more. What they have done they have done accurately and well. But the record they have saved for us is a partial record. What had happened with respect to religious belief is on a par with what had happened with respect to language. From Takkasilā all the way down to Champā no one spoke Sanskrit. The living language, everywhere, was a sort of Pāli. Many of the old Vedic words were retained in more easily pronounceable forms. Many new words had been formed, on analogy, from the existing stock of roots. Many other new words had been adopted from non-Aryan forms of speech. Many Aryan words, which do not happen to occur in the Vedic texts, had nevertheless survived in popular use. And meanwhile, in the schools of the priests, and there only, a knowledge of the Vedic language (which we often call Sanskrit) was kept up. But even this Sanskrit of the schools had progressed, as some would say, or had degenerated, as others would say, from the Vedic standard. And the Sanskrit in actual use in the schools was as far removed from the Vedic dialect as it is from the so-called classical Sanskrit of the post-Buddhistic poems and plays. So with the religion. Outside the schools of the priests the curious and interesting beliefs recorded in the Rig Veda had practically little effect. The Vedic thaumaturgy and theosophy had indeed never been a popular faith, that is, as we know it. Both its theological hypotheses and its practical magic (in  the ritual) show already a stage very much advanced beyond the simpler faith which they, in fact, presuppose. The gods more usually found in the older systems  the dread Mother Earth, the dryads and the dragons, the dog-star, even the moon and the sun  have been cast into the shade by the new ideas (the new gods) of the fire, the exciting drink, and the thunderstorm. And the charm of the mystery and the magic of the ritual of the sacrifice had to contend, so far as the laity were concerned, with the distaste induced by its complications and its expense. But a comparison with the general course of the evolution of religious beliefs elsewhere shows that the beliefs recorded in the Rig Veda are not primitive. A consideration of the nature of those beliefs, so far as they are not found elsewhere, shows that they must have been, in the view of the men who formulated them, a kind of advance on, or reform of, the previous ideas. And at least three lines  of evidence all tend to show that  certainly all the time we are here considering, and almost certainly at the time when the Rig Veda was finally closed  there were many other beliefs, commonly held among the Aryans in India, but not represented in that Veda. The first of these three lines is the history of the Atharva Veda. This invaluable old collection of charms to be used in sorcery had been actually put together long before Buddhism arose. But it was only just before that time that it had come to be acknowledged by the sacrificial priests as a Veda  inferior to their own three older ones, but still a Veda. This explains why it is that the Atharva is never mentioned as a Veda in the Buddhist canonical books. They are constantly mentioning the three Vedas and the ancient lore connected with the three. They are constantly poking fun at the hocus-pocus of witchcraft and sorcery, and denying any efficiency either to it, or to the magic of the sacrifice. But in the view of the circles in which these books arose the Atharva collection had not yet become a Veda. The second is the general view of religious beliefs, as held by the people, given to us in the Epics, and especially in the Mahā Bhārata. It is, in many respects, altogether different from the general view as given in the Vedic literature. We do not know as yet exactly which of the conceptions in the Mahā Bhārata can be taken as evidence of the seventh century B.C. The poem has certainly undergone one, if not two or even three, alterations at the hand of later priestly editors. But though the changes made in the poems are due to the priests, they were so made because the priests found that ideas not current in their schools had so much weight with the people that they (the priests) could no longer afford to neglect them. 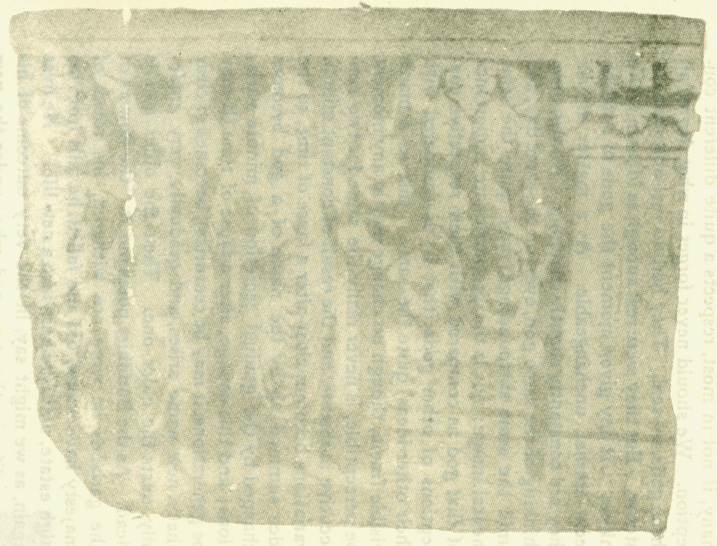 They must have recast the poem with two main objects in view  in the first place to insist on the supremacy of the brahmins, which had been so much endangered by the great popularity of the anti-priestly views of the Buddhists and others; and in the second place to show that the brahmins were in sympathy with, and had formally  adopted, certain popular cults and beliefs highly esteemed by the people. In any case, there, in the poem, these cults and beliefs, absent from the Vedic literature, are found in full life and power. And though this line of evidence, if it stood alone, would be too weak to bear much weight, the most likely explanation seems to be that here also we have evidence, to some extent at least, of beliefs not included in the Vedic literature, and yet current among, and powerfully affecting, both the Aryan and the semi-Aryan peoples of India. 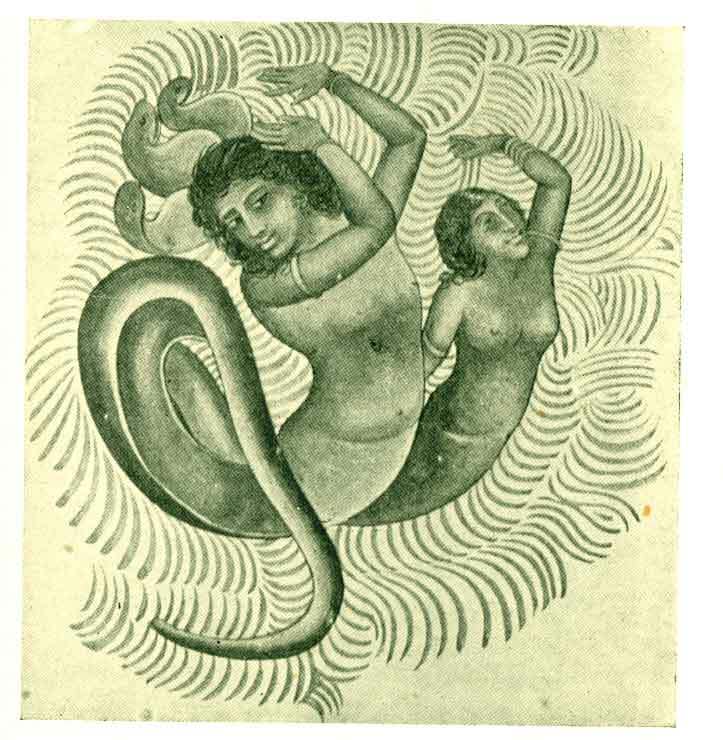 valuable to the historian, of all kinds of animistic hocus-pocus  evidently forming part of the beliefs of the people in the valley of the Ganges in the sixth century B.C., for how otherwise could such "low arts" have been the source of gain to the brahmins and others who practised them? We are told of palmistry, divination of all sorts, auguries drawn from the celestial phenomena, prognostications by interpretation of dreams, auguries drawn from marks on cloth gnawed by mice, sacrifices to Agni,  it is characteristic to find these in such company,  oblations of various sorts to gods, determining lucky sites, repeating charms, laying ghosts, snake charming, using similar arts  on other beasts and birds, astrology, the power of prophecy, incantations, oracles, consulting gods through a girl possessed or by means of mirrors, worshipping the Great One, invoking Sirī (the goddess of Luck), vowing vows to gods, muttering charms to cause virility or impotence, consecrating sites, and more of the same kind. It is a queer list; and very suggestive both of the wide range of animistic superstitions, and of the proportionate importance, then and to the people at large, of those particular ones included in the Veda. a special legend to excuse their doing so and in that they incidentally mention her, once again, in  mystic conjunction with the dread deities of the Moon, and the Sun, and Mother Earth. Even these other three, though noticed in the Veda, are put far into the background compared with Indra, Agni, Soma, and Varuṇa; but it is highly probable that they really occupied a very much larger share in the minds of the people of India than these sparse notices in the Veda would tend to show. In modern mythology Sirī or .Srī is regarded as a consort of Vishṇu. The other two passages, in verse, form whole Suttantas  the Mahā Samaya Suttanta, No. 20, in the Digha, now edited for the Pāli Text Society, and translated in my Dialogues of the Buddha, vol. ii. ; and the Āṭānaṭiya Suttanta, No. 32, in the same collection. In the first of these two poems some unknown early Buddhist poet describes how all the gods of the people come to pay reverence, at Kapilavastu, to the new teacher, and to his order of mendicant recluses. In the second of them another unknown poet describes how certain of the gods come to ask him to adopt a form of words which will turn the hearts of other deities unfriendly to the new doctrine, and make them leave it and its followers in peace. And the form of words gives the names of all the gods whom it is considered desirable thus to propitiate. the Veda or in the pre-Buddhistic Upanishads, the myth seems to be a strange jumble of beliefs, not altogether pleasant, about a strangely gifted race of actual men; combined with notions derived  from previously existing theories of tree-worship, and serpent-worship, and river-worship. But the history of the idea has still to be written. These Nāgas are represented on the ancient bas-reliefs as men or women either with cobra's hoods rising from behind their heads or with serpentine forms from the waist downwards. Then come the Garulas, or Garuḍas, the Indian counterpart of the harpy and griffin, half man, half bird, hereditary enemies of the Nāgas, on whom they feed. They were also, perhaps, originally a tribe of actual men, with an eagle or a hawk as their token on their banner. Then come a goodly crowd of Titans, and sixty kinds of gods, of whom only about half a dozen are Vedic, the other names offering only puzzles which await the solution of future enquirers. First we have the gods of kindly nature and good character; then the souls or spirits supposed to animate and to reside in the moon and the sun (the moon is always mentioned first), in the wind, the cloud, the summer heat; then the gods of light; then a curious list of gods, personifications of various mental qualities; then the spirits in the thunder and the rain; and, lastly, the great gods who dwell in the highest heavens (that is, are the outcome of the highest speculation), like Brahmā himself, and Paramatta, and Sanaṃ Kumāra. Now, so far as I can call to mind, none of these fancies (with one interesting exception, on which see below) is referred to in the principal early books setting out the Buddhist doctrine  the Four Nikāyas, for instance, and the Sutta Nipāta. But in older and later documents several of these beliefs can be found. The conclusion is obvious. Those beliefs as to tree-worship mentioned in pre-Buddhistic literature formed part, at the time of the rise of Buddhism, of the religion of the people. They were rejected by the early Buddhists. But they continued to form part of the religion of those of the people who were uninfluenced by the new teaching. And one or two of them found their way back into one or other of the later schools of Buddhism. All the above is tree-worship  or more correctly dryad-worship  pure and simple. When we find the world-soul spoken of as a tree that has its roots in heaven, that is poetry, a simile based perhaps on the mystery of growth, but still only a simile. The idea of the Kalpa-rukkha, the Wishing Tree, which will give one all one wants, has not as yet been traced back earlier than some centuries after the date we are considering. see that the tree has over it an inscription stating that it is "the Bodhi Tree. 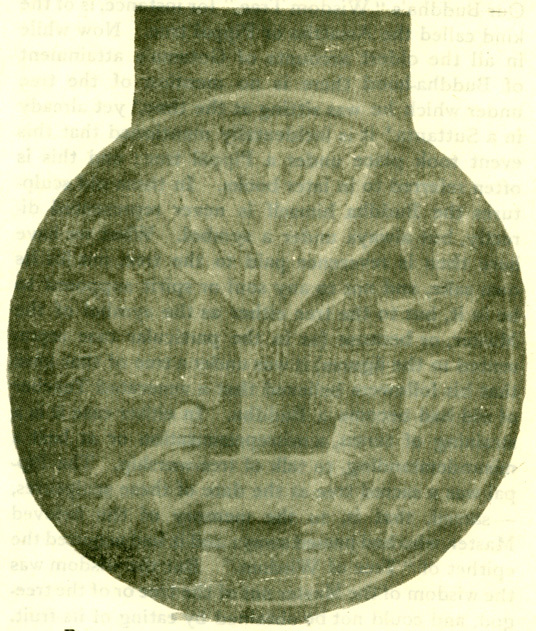 the tree of wisdom, of Kassapa the Exalted One" Every Buddha is sup-  posed to have attained enlightenment under a tree. The tree differs in the accounts of each of them. Our Buddha's "Wisdom Tree," for instance, is of the kind called the Assattha or Pippal tree. 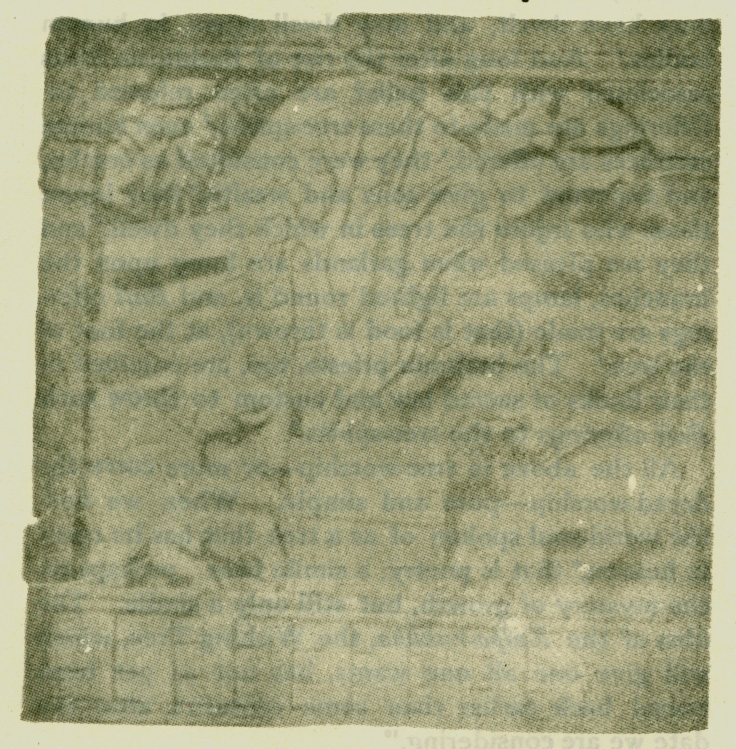 Now while in all the oldest accounts of Gotama's attainment of Buddha-hood there is no mention of the tree under which he was sitting at the time, yet already in a Suttanta it is incidentally mentioned that this event took place under a Pippal tree; and this is often referred to in later books. In these old sculptures the Buddha himself is never represented directly, but always under a symbol. What we have here then is reverence paid to the tree, not for its own sake, and not to any soul or spirit supposed to be in it, but to the tree either as the symbol of the Master or because (as in the particular case represented in the figures) it was under a tree of that kind that his followers believed that a venerated Teacher of old had become a Buddha. In either case it is a straining of terms, a misrepresentation or at best a misunderstanding, to talk of tree-worship. The Pippal was sacred tree at the date of these sculptures,  sacred that is, to the memory of the beloved Master who had passed away; and it had acquired the epithet of "Tree of Wisdom." But the wisdom was the wisdom of the Master not of the tree or of the tree-god, and could not be obtained by eating of its fruit. Another hypothesis is possible  that the disciples, in all good faith, associated their Master with this particular tree because it already, before his time, had been especially sacred above all other trees. The tradition may then have been the result of this feeling. The tree was certatnly held in high esteem even as early as the Vedic poems. Vessels for the mystic Soma cult were made of its wood; and so were the caskets containing the medicinal herbs used in the mystic craft of the physician of the day. The upper portion in the fire-drill  and the production  of fire was held to be a mystery  was of the wood of the Pippal tree. And in one passage the tree in heaven under which the souls of the blessed recline is likened to a Pippal. Whether this would be sufficient reason for the rise of the tradition may be doubtful. But such associations would certainly add to its hold on popular imagination, if it had once otherwise arisen. It is, however, never to the Pippal tree to which the folklore quoted above attributed divine power. It happens always to be some other tree. And we know too little to be able to be quite sure that this is merely a matter of chance. 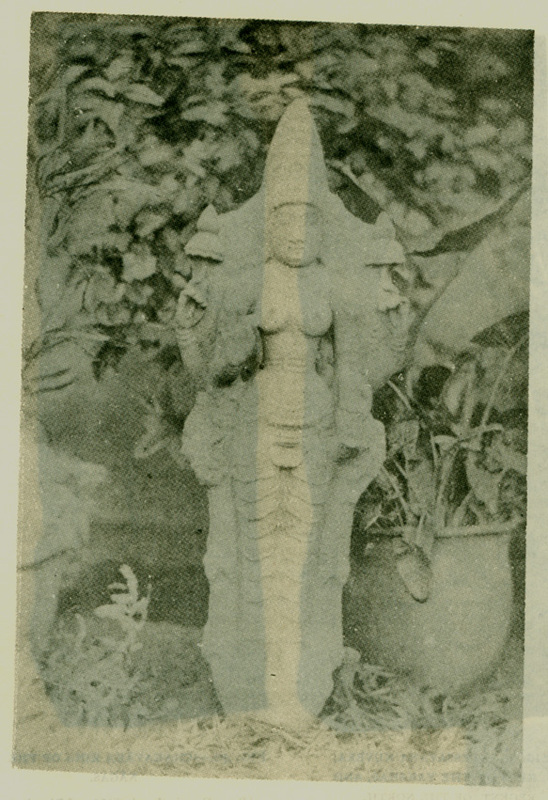 The tree-deities were called Nāgas, and were able at will, like the Nāgas, to assume the human form; and in one story the spirit of a banyan tree who reduced the merchants to ashes is called a Naga-rāja, the soldiers he sends forth from his tree are Nāgas, and the tree itself is "the dwelling-place of the Naga." This may explain why it is that the tree-gods are not specially and separately mentioned in the Mahā Samaya list of deities who are there said by the poet to have come to pay reverence to the Buddha. In any case we must add tree-worship, the worship of powerful spirits supposed to dwell in trees, to the list of those beliefs, scarcely noticed in the Vedas, that were an important part of the religion of the peoples of Northem India at the time of the rise of Buddhism. So Jupiter ousted Chronos, and Indra himself had almost ousted Trita, even in the Veda; and Indra and others had almost ousted Varuṇa. So in the period we are considering had Sakka, in his turn, almost ousted Indra. Though the epic poets afterwards did their best to re-establish Indra on the throne, they had but poor success; for his name and his fame had dwindled away. And we catch sight of him, in these records, just as he is fading dimly away on the horizon, and changing his shape into that of the successor to his dignity and power. It is the same, but in each case in different degrees, with other Vedic gods. It were tedious here to go at length into each case. Isana, the vigorous and youthful form of the dread Siva of the future, is already on a level with Soma and Varuṇa. And Pajāpati and Brahmā wiil soon come to be considered as co-partners with Sakka in the lordship over all the gods. The worship of Agni is scoffod at as on a par with the hocus-pocus of witchcraft and divination, and it is soon to be laughed to scorn in the amusing tales of the folklore of the people. Vāyu, the wind god, never very important, is just mentioned in our list, but nowhere else in texts of that age, and will soon also be the laughing-stock of the story-teller. Varuṇa is still a power, ranked with the highest, but he will soon be reduced to a tree-god, a Nāga king, a lord of the oracle girls,  who, possessed by the god, will, as Pythias, prophesy smooth things. And Vishṇu, though mentioned in our poem under the name of Veṇhu, has scarcely as yet appeared above the horizon. Pajjunna is still the rain-god in the Suttantas; he is mentioned in both poems; and has retained this character even in the folklore. I know of no other Vedic gods mentioned in this literature. Dyaus, Mitra, and Sāvitri, Pūshan, the Ādityas, the Asvins and the Maruts, Aditi and Diti and Urvasī, and many more, are all departed. They survive only within the enclosures of the Vedic schools. The people know them no longer. Now there is no doubt a long interval of time between the close of the Rig Veda collection of hymns and the rise of Buddhism. The Vedic anthology, small as it is, may not give, even for its own time, a complete statement of Indian belief. Some of the differences between Vedic mythology and popular religion at the time of the rise of Buddhism may therefore be due to the influence of an unrecorded past. But this can only explain a part, and probably a small part, of the difference. The old gods, that is the old ideas, when they have survived, have been so much changed; so many of them have not survived at all; so many new ones have sprung into vigorous life and wide-reaching influence, that one conclusion is inevitable. The common view that the Indians were very different from other folk in similar stages of development, that to that difference was due the stolid, not to say stupid, conserva-  tism of their religious conceptions, that they were more given to superstition, less intellectual, than for instance the Greeks and Romans, must be given up. Derived partly from a too exclusive study of the priestly books, partly from reading back into the past a mistaken view of modern conditions, it cannot stand against the new evidence derived from the Jain and Buddhist literatures written, or rather composed, in independence of the priests. The real facts lead to the opposite view. They show a constant progress from Vedic times onwards. Some reasons for this will be suggested in the next chapter. But whatever the facts, and whatever the reasons for them, we are not likely to cease from hearing that parrot cry of self-complacent ignorance, "The immovable East"  the implied sop to vanity is too sweet to be neglected. 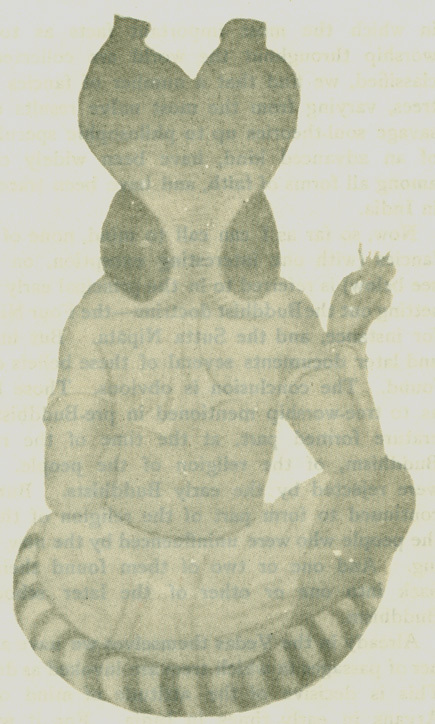 Satapatha Brahmaṇa, xi. 4, 3. See, for instance, Saŋyutta, vol. v. pp. 47, 63. Chand, Up. vi. 11; see Jāt. 4. 154. Jāt. 5. 472, 474, 488. Jāt. Nos. 98, 109, 307, 493. Jāt. 3. 23; 4. 153. Kaāṭhaka Up. vi. 1; Svet. Up., iii. 9. The earliest reference to this idea I have been able to find is the Āyāranga, p. 127 (see Jacobi, Jaina Sutras, 1. 197). Jātakas Nos. 35 and 162. S. 1. 219; Jāt. 5. 28, 6. 201. 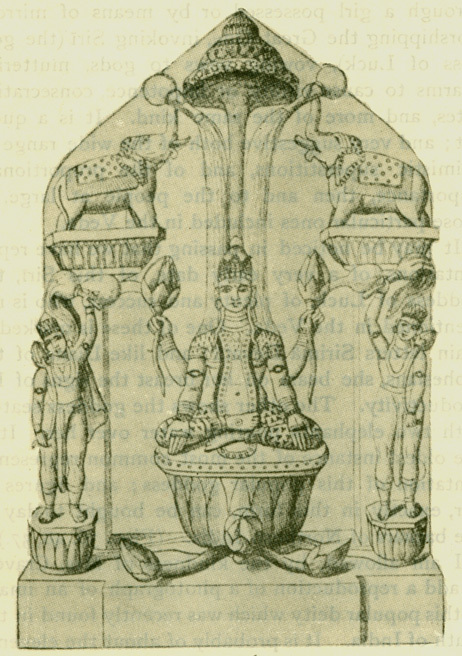 The Vāruṇis, Jāt. 6. 586.